The occupations in which the largest number of jobs are expected to become available in future are among those that we would have expected to employ the largest number of EU nationals. Stopping the flow of low-skilled migrants into the UK could lead to unfilled vacancies, which could ultimately act as a drag on the UK economy. Wages could rise to make some occupations more desirable to UK residents, but this could lead to higher prices and reduced competitiveness. Cost increases in social care may lead to people taking time out of the labour market to care for older family members. In its recent report, EEA Migration in the UK, The Migration Advisory Committee (MAC) chose not to recommend an explicit work migration route for low-skilled workers; a move that would all but end low-skilled migration into the UK. The extent to which this will help or hinder the UK economy depends on how reliant UK occupations are on EU nationals, whether employment in these occupations is expected to grow or shrink in the future; and whether they are high, medium or low-skilled. The Working Futures 2014-2024 analysis, together with a look at the Office for National Statistics’ Annual Population Survey (APS), can help to illustrate which occupations may be most vulnerable to changes in the number of EU nationals working in the UK. A reminder: what is Working Futures? Working Futures is a series of labour market projections, undertaken by Cambridge Econometrics and the Institute for Employment Research at the University of Warwick. The latest in the series was published in 2016 and covered the decade to 2024, providing detailed employment projections by industry and occupation. For this analysis, I’ll focus on the second half of the forecast period, covering the 5 years from 2019-2024. All figures are for the UK. These forecasts pre-date the referendum, giving us a reasonable illustration of what the labour market might have looked like had we remained in the EU, with free movement of people. A note on occupational groups: the occupational groups shown below are those in the Standard Occupational Classification for the UK (known as SOC 2010), which are split into nine numbered groups. The smaller the number, the more highly skilled the occupations are within the group; with group 1 consisting of managerial occupations and group 9 of elementary occupations. Occupations expected to provide the highest number of job openings are also among those that, without migration restrictions, we would expect to have employed the largest number of EU nationals in the future. In Chart 1 the grey bars represent the total number of jobs expected to become available in the 5 years to 2024, created through a combination of structural changes in the economy (i.e. changes in total employment), the retirement of older workers and people leaving or entering occupations for other reasons (e.g. career changers). The orange line with markers shows the percentage of those employed in each occupation who are EU nationals, in the 2017-18 APS. For example, 25% of those employed in elementary trades and related occupations in 2017-18 are EU nationals. 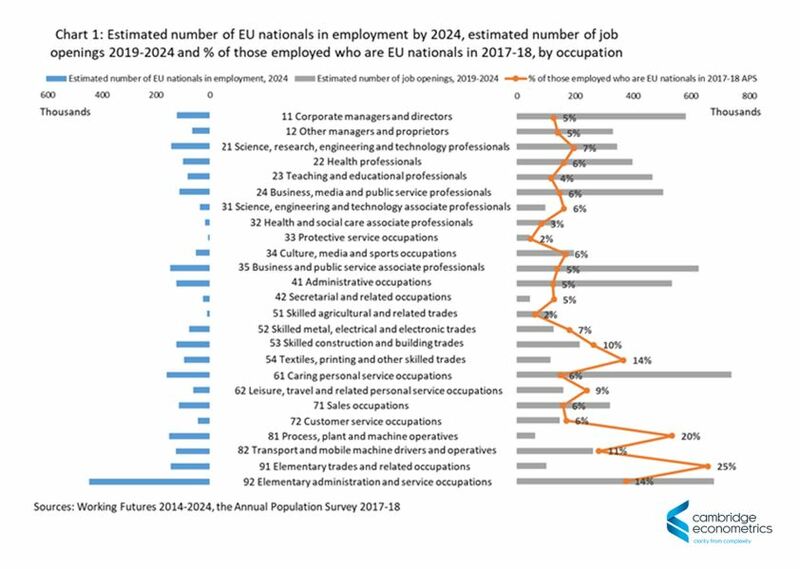 The blue bars show the estimated number of EU nationals expected to be employed in each occupation in 2024, which is derived from simply multiplying the APS percentages by the estimated total number of people expected to be employed in each occupation in 2024, according to Working Futures. Now, this is far from the most complex calculation we do here at CE, but it does provide a useful illustration of how significant EU nationals are to different occupational groups. It’s important because if the number of EU nationals in employment in 2024 is lower than currently forecast, this would create additional job openings. Elementary services is the lowest skilled occupational group. At current rates, it would have employed the highest number of EU nationals in 2024 by far; and is expected to create the second-largest number of job openings behind caring and personal services, which would have employed the second-highest number of EU nationals in 2024. The process, plant and machine operatives group is only expected to create a relatively small number of job openings, but would have employed the third largest number of EU nationals in 2024. Shutting the door on low-skilled migration into the UK could be a risky move, because EU nationals play an important role in low-skilled occupations that are expected to create a significant number of jobs over the next 5 years. The Government has previously announced that the rights of EU nationals already living and working in the UK would be safeguarded. This is great news for the labour market today, but is not enough to protect us from potential labour shortages tomorrow. What about the job openings that don’t exist yet, driven by future expansion and the well-earned retirements of today’s hard workers? As this analysis shows, stopping the flow of low-skilled migrants into the UK today could lead to many unfilled vacancies over the next few years, which could ultimately act as a drag on the UK economy. In elementary services in particular, a reduction in the number of EU nationals in employment could create a significant number of vacancies in an occupation which is already expected to create a large number of job openings over the next 5 years. Without a supply of low-skilled migrants, these jobs would have to be filled by the UK resident workforce, replaced by machines or carried as vacancies by employers. Caring and personal services occupations are expected to experience the highest number of job openings, but would have also employed a significant number of EU nationals. Jobs in this occupational group are more highly skilled than elementary services and the social care sector is already experiencing recruitment and retention difficulties, which could be exacerbated by any reduction in EU nationals working in the sector. What might happen in the face of a labour shortage? 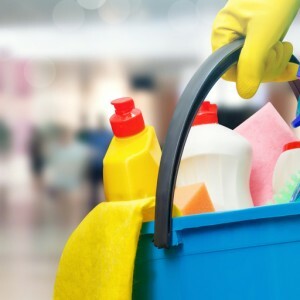 Wages could rise to make these occupations more desirable to UK residents, but this could have implications elsewhere in terms of higher prices and reduced competitiveness; and may not be an option for some employers already struggling in an uncertain economic environment. Cost increases in social care may price people out of the market, leading to the unintended consequence of people taking time out of the labour market to care for older family members. Can the UK labour market cope without relying on EU nationals to fill its many lower-skilled job openings? It looks for all the world like employers will have to find a way, though this may well come at a cost for the UK economy.